A nourishing lunch is an essential part of healthy eating and living. Lunch provides your body with fuel for the rest of the day, giving you energy throughout your afternoon, keeping your metabolism revved, and regulating blood sugar levels. But when your lunch options depend on your local grab-and-go spots, it can easily be filled with greasy foods and oversized portions. That is why we recommend packing your own lunch a couple of times per week – it may take a little extra planning and preparation, but with the right mindset and a little practice, the benefits will always outweigh the costs. Combining the right types of foods is key in creating a nutritious lunch. While a sweetened iced coffee or a grilled cheese on white-bread may satisfy an immediate craving, it won’t fuel you well and can leave you tired and lethargic for the rest of the afternoon. Adequate midday nourishment will set you up for the remainder of the day, preventing you from grabbing that sugary afternoon snack or overeating at dinner, so it is important to be mindful of your lunch decisions. Loading up on complex carbohydrates and lean protein will keep you feeling full longer, as your body takes more time to digest these foods. Make your base a variety of vegetables for their antioxidants, nutrients, and high fiber content, and then pair it with 4-6 oz. lean protein, and an optional 1/3 cup of whole grains, such as farro or quinoa. Or make it vegetarian and sub in ½ cup of beans. If you need some inspiration, contact your LMN dietitian for our Salad bar, and learn how to build a better salad for lunch. 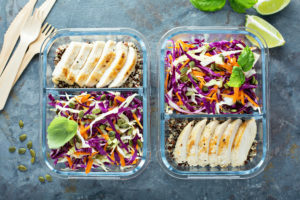 While preparing lunch in advance may seem like a daunting task, with time and a little prep, it can become an easy part of your daily routine, saving you money, excess calories, and sodium from restaurant foods. The number one rule is to keep lunch simple: there is no need to bust out your spiralizers and follow elaborate recipes. Instead, skip the muss and fuss, and make wholesome sandwiches, simple and clean salads, or roasted vegetables from the night before. Setting aside a portion of your dinner for tomorrow’s lunch is an easy way to ensure a healthy and easy meal the next day. Keeping things simple will motivate you to continue with packed lunches. Once you are in the groove of bringing your lunch to work, you can start to plan ahead. During your weekly trip to the grocery store, load up on vegetables, easy grab-and-go whole grain options, and prepared proteins. Then on Sunday night, prepare your lunches for the next five days. This will save you time in the mornings when you are already in a rush, and make bringing lunch to work a no-brainer. “When I’m organized my favorite thing to do is make extra dinner and bring it with me to work the next day. In the fall I love to do a big veggie roast with cauliflower, Brussels sprouts, sweet potato, red onion and organic chicken sausages, toss it all with garlic, olive oil and rosemary and bake for about 30 minutes. All those veggies are sturdy and hearty enough that they stand up really well to being reheated the next day.